Our March Special Collection was for our own “Dreamers Scholarship”, which goes to California State University Long Beach undocumented students who qualify under AB540 (considered as state residents). Funds collected go directly to the students. The Dreamers scholarship committee will present the UUCLB Dreamers Scholarship to the recipients at … read more. Every Saturday St. Luke’s Episcopal Church in downtown Long Beach opens its facilities to those in need for showers and supplies, and on 2nd and 4th Saturdays for meals. We collect donations of clothing and supplies at UUCLB for this program, and volunteers are … read more. Do you know WordPress, or want to learn? Do you want new people to discover our church on their mobile devices or the internet? The most fun committee at UUCLB needs some serious-minded people to update our news and events on our website and be part … read more. 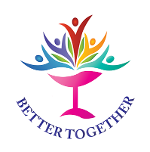 At the annual congregational meeting on May 6, UUCLB members came together to elect our leaders and approve the budget for the coming year, and to recognize members who have been of service to the church and larger community. Come to the Summer Potluck Picnics, from 5:30 to 7 p.m. on the second Thursdays of each month: June 14, July 12, August 9, and September 13. Bring a side dish to share – one that feeds several people. You may also bring an item … read more. 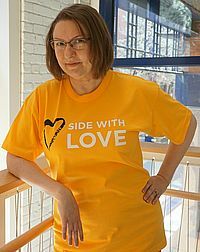 The updated “Side With Love” T-Shirts with UUCLB on the back are now available to order at church after Sunday services. Unisex style, in these sizes: xS, S,M.L,xL 2xL, 3xL. Cost is $15 each, $17 for 2xl and 3xl. Additional styles and sizes are available at … read more. The Special Collection during May 2018 (all collections from the May 6 service, and any others marked “Special Collection” during the month) will be directed to Food Finders. Food Finders is a multi-regional food bank and food rescue program headquartered in Lakewood, CA. They pick … read more. A Little Free Library to come! In honor of Diane Julian’s long service as Membership Coordinator and her love for books, we have purchased a Little Free Library to be installed on the UUCLB campus. Bring a lightly used or almost new book to fill the library and plan to bring … read more. On Monday, April 30, these people will be furnishing dinner for the residents of Project Achieve: … read more. Saturday, May 12th, 7:00PM – Experience … read more.